According to the new rumors, Microsoft is now working on Windows 10 CloudBook devices to target the education sector. 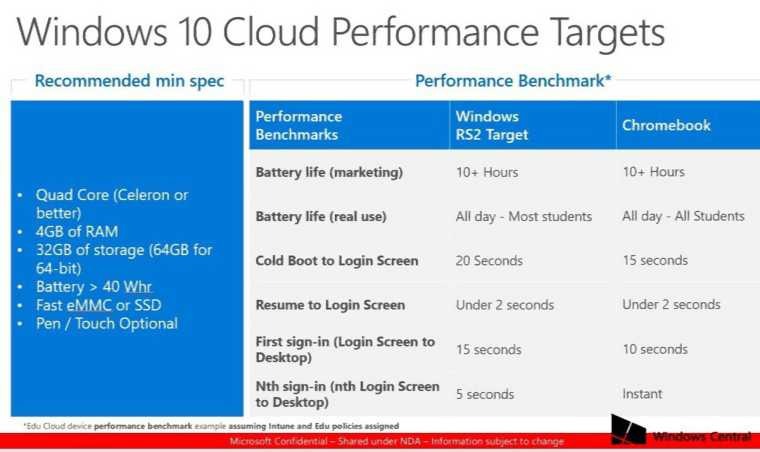 A new internal document leaked today detailing the recommended minimum specifications for Windows 10 Cloud supported devices, along with performance benchmarks against Google’s Chromebooks. Windows 10 Cloud only supports app from Windows Store including Win32 apps that have been converted using the Desktop App Bridge (Project Centennial) and listed in the Store. In addition, you can upgrade the OS to different Windows 10 editions. Microsoft is expected to shed more light on Windows 10 Cloud and Windows 10 Cloudbook on May 2.